Hosni Mubarak’s main lawyer on Tuesday challenged prosecution calls for Egypt’s former president to be hanged for the deaths of protesters, saying there is no evidence to show he ordered security forces to open fire. 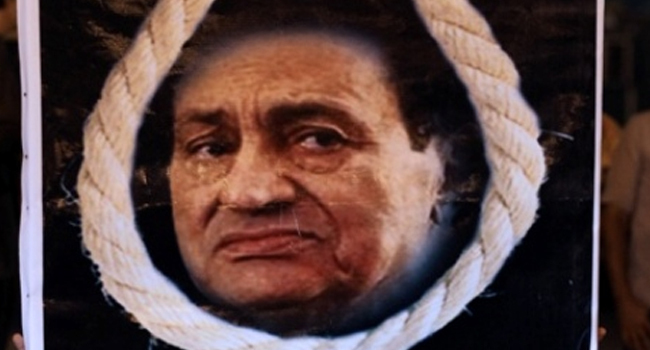 Mubarak was wheeled into court as his defence began a five-day challenge to calls for the ex-strongman who was ousted from power last February 11 to be executed for the deaths of hundreds of pro-democracy protesters. “There is no evidence to prove that Mubarak gave orders to open fire on the protesters,” lawyer Farid al-Deeb said, citing what he said was testimony by Egypt’s military ruler Field Marshal Hussein Tantawi and former spy chief Omar Suleiman. Tantawi and Suleiman testified last year behind close doors and the court imposed a gag order on their testimony, but according to lawyers both have said they had no knowledge that Mubarak gave such orders. On October 2, Tantawi himself said in a speech that Mubarak never ordered his security forces to open fire on demonstrators who rose up against him in January-February 2011, forcing him to quit after 18 days of protests. “Nobody asked us to open fire and nobody will open fire” on the people, Tantawi said at the time. Deeb spent one hour listing Mubarak’s achievements from the time of his birth in 1928 until his ouster, describing him as “a respectable man who is neither bloodthirsty nor aggressive,” an AFP correspondent said. The ailing 83-year-old Mubarak was wheeled into court lying on a stretcher under a blanket, his eyes shielded by dark sunglasses. Presiding judge Ahmed Refaat told the audience that the court has pledged to allow the defence to submit arguments and documents “that preserve the rights of the defendants.” Refaat has given the defence team 25 sessions until February 16 to make their case and Deeb said in published statements on Tuesday that he has requested five days to deliver his arguments. Chief prosecutor Mustafa Suleiman said at a previous hearing that Mubarak must have ordered police to open fire on protesters during violence which left more than 850 people dead. Mubarak “must have agreed on the killings,” Suleiman told the court on January 5, explaining that co-defendant and former interior minister Habib al-Adly would have given the orders to police commanders to fire on protesters. Six senior Adly aides are also being tried in the case while Mubarak’s two sons, Gamal and Alaa, are on trial with their father on separate charges of corruption in the same court. Deeb denied newspaper reports that Gamal Mubarak and his mother Suzanne gave him instructions on how to present his case and refused to reveal his strategy. He reportedly told the government daily Al-Akhbar that he “does not have a magic wand, nor surprises to offer,” and that he would present his defence “in line with the law.” The flagship government daily Al-Ahram said on Monday that Deeb would make surprise revelations. Deeb, meanwhile, told Al-Masry Al-Youm that Kuwaiti lawyers were among several attorneys who had joined the defence team but would not take an active part in arguing the case. He also insisted that Mubarak must lie on a hospital bed throughout the trial and not sit on a chair as he did during the last hearing.